Build like a mortal, win as a God! 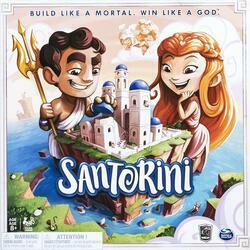 Santorini is a pure strategy game very accessible, where you play as a young Greek God (or Goddess) competing to bring the best help to the citizens of the island in the construction of a beautiful village in the middle of the Aegean Sea .. . Your goal is to place one of your two workers on top of a three-story building. Each turn, you must move one and build on one of the adjacent squares a building element. Watch a city rise quickly on the plateau, like the island of Santorini! To prevent a player from reaching the third landing, a blue dome can be placed on it. The 25 boxes of the board, the three possible degrees of construction allow an incredible number of strategies. The parts can multiply without ever being alike! You can appeal to divine favors to profoundly change the way you play. 30 Gods are available. Contemplate the city of Santorini rising all around you, see these blue domes force you to new tactics, play hours, two, three or even four! A game that mixes the pleasure of strategy with that of construction is Santorini! Santorini was funded on the Crowdfunding Kickstarter (See the campaign) platform on the 28 April 2016, the campaign lasted 30 days. 7,112 people helped funded the game, whose the amount requested was CA$85,000.00. Thanks to these 7,112 people the game could be funded up to CA$700,524.75, ~824.15%.